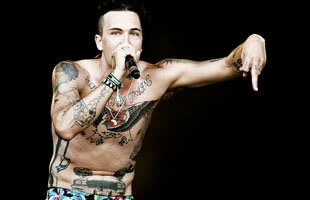 Yelawolf is another one of hip-hop's ever-increasing genre-blending artists. Hailing from Alabama, Yela went from being homeless to being signed with Interscope and down with Shady Records thanks in large part to his excellent 2010 mixtape Trunk Muzik. For Complex, Yela represents the new breed of hip-hop superstars. Listen to Yelawolf's "Honey Brown"
Yelawolf is Back to Riding Dirty In His "Box Chevy V"
Travis Barker Links Up with Paul Wall, Hopsin & Yelawolf on "Cuz I'm Famous"
Mixtape: Da Mafia 6ix "6ix Commandments"
Video: Da Mafia 6ix f/ Yelawolf "Go Hard"
Listen: Da Mafia 6ix f/ Yelawolf "Go Hard"
Mixtape: Yelawolf "Trunk Muzik Returns"
Yelawolf Unveils Artwork and Tracklist for "Trunk Muzik Returns"
Listen: Yelawolf f/ A$AP Rocky and Big Henry "Gangster"
Is a New Eminem Album Dropping This Summer?